Be the first to share your favorite memory, photo or story of Richard "Dik". This memorial page is dedicated for family, friends and future generations to celebrate the life of their loved one. Richard D. "Dik" Delhotal 67 of Mendota, formerly of West Brooklyn passed away November 6, 2018 in his residence. Services will be Saturday November 10, 2018 at 12 noon with Rev. Peter Pilon officiating. Burial of ashes will follow at St. Mary's Cemetery, West Brooklyn. Visitation will be 9 until noon in Schwarz funeral Home. Cremation rites have been accorded. Dik was born May 8, 1951 to Delmar and Charlotte (Glaser) Delhotal. He graduated Mendota High School in 1969. Dik married Becky Albers on May 8, 2008 in Las Vegas. 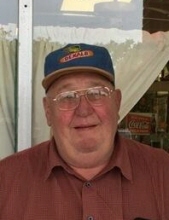 During his work career he worked for Del Monte and Bay Valley Foods as a mechanic., retiring in 2012 after many years. Very involved in his community, Dik belonged to: Mendota Moose Lodge, The Mendota Elks Lodge #1212, the Knights of Columbus, Optimist Club of Mendota, Ducks Unlimited, and was a founding member of the Mendota Men's Softball League serving as the leagues first President. One of Dik's favorite roles was that of Santa Claus. He was the Mendota area Santa for many years, and put on the beard and boots for 49 wonderful years, delighting hundreds of children and adults alike. Survivors include: his wife Becky of Mendota; one son: Adam Delhotal of Kings Park, NY; his Mother: Charlotte of Mendota; two grandsons: Kyle and Paul; 5 step grandchildren; two brothers: Charlie (Diane) Delhotal of Mesa, Az.and Jim (Carrie) Delhotal of Mendota, three sisters: Peggy (Tom) Carr of Princeton, Kathy (Joe) Schmitt of Peru and Lori (Mike) Hubbell of Dixon. He is preceded in death by his Father and first wife Mary. Memorials may be directed to Donor's Choice. To send flowers or a remembrance gift to the family of Richard "Dik" D. Delhotal, please visit our Tribute Store. "Email Address" would like to share the life celebration of Richard "Dik" D. Delhotal. Click on the "link" to go to share a favorite memory or leave a condolence message for the family.